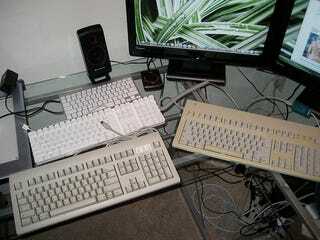 Some are frequent keyboard switchers, some are faithful to a single peripheral. But we all still believe that there's a perfect keyboard out there somewhere. While we're searching for it we want to know: What are you typing on? Are you a sucker for that satisfying clickety-clack of an old IBM keyboard or is it all about an input device that matches your decor? Tell us what you're using and why. Bonus points if you include pictures of your keyboard setup in the comments.